Swimming is a great idea to cool yourself in summer. You can even encourage your furry pal to join you for a swim, if you have got a dog-friendly lake or backyard pool. If he has never been for swimming, don’t assume that your dog will intuitively know how to swim. He will need some help and teaching your pooch can be fun and both can have a great time. 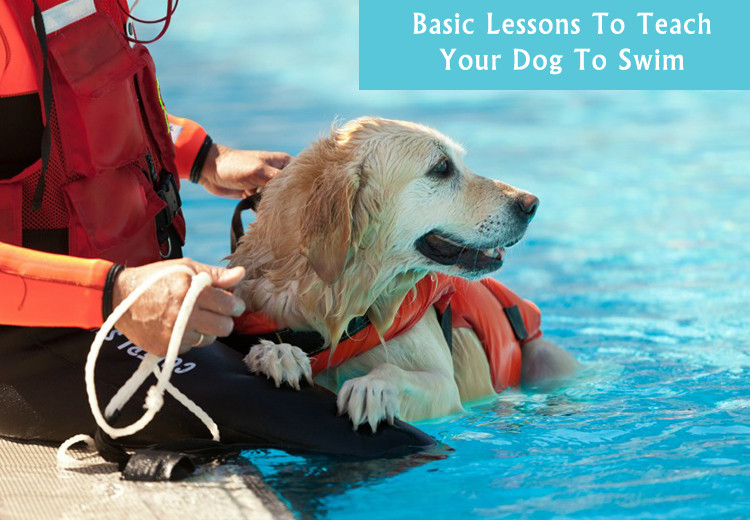 For this, here are the basic lessons to teach your furry companion to swim. Create a marker like a flag and teach your pooch to touch that marker before he enters the water. Show him the steps, ramp, or ladder from the deck and say “steps.” Then take him a short distance away and repeat. Gently place him in the water with his feet on the top step. You may need to take your friends or anybodies help, so that you be in water and the other person stay at the top of the steps. If you are training your dog by yourself, attach a leash or long line before you put him in the water and you stay by the side of the pool. Say “steps” and let him gain his footing up the ramp. Slowly increase the distance from the ramp or steps, and make him swim to the steps and exit. Make sure you don’t take him in deeper area of the pool, stay in shallow end till he learn the swimming properly. Keep the lessons short that is not more than ten minutes, as he may get tired and loose his control in the water. To help your dog swim, position your hands so his rear end is up so he will use all four legs to swim. He should look like he is running in the water. You may need to help him by moving his rear legs for him. If he just uses his front legs, he will most likely sink. His neck should extend forward and his head should not point up. Use a food lure if necessary to get him in this position. Give him a bath with a dog shampoo after swimming session gets over, and be sure to dry out his ears. Check his eyes because they may become irritated by the chlorine and need to be rinsed. After he learns to swim, don’t let him overexert himself. Swimming is a physically taxing exercise, and he can easily become fatigued. Take breaks, and watch for signs of exhaustion. Sometimes any tragedy can take place, despite your best efforts for example: your dog may get motionless in the water. At this time, you need to get him out of the water. If he not breathing, hold his rear legs up to let water drain. Put him on his side. Clear the debris from his mouth, close his mouth with your hand, and apply mouth-to-nose resuscitation and chest compression’s. You should take care of pet health and pet hygiene as well as be prepared any emergency remedies. If you are not able to handle the situation take him to the vet immediately. If you have taught him how to swim and to find the ramp or steps, you can avoid such tragedy to happen with him. Hope these simple tips will help you to teach a good swimming to your pooch and have a fantastic time swimming together.